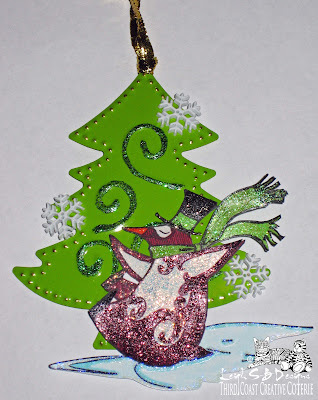 Velvet Paw Creations: "Percy On Ice" Removable Christmas Tree Ornament Card designed for the 3CCC! 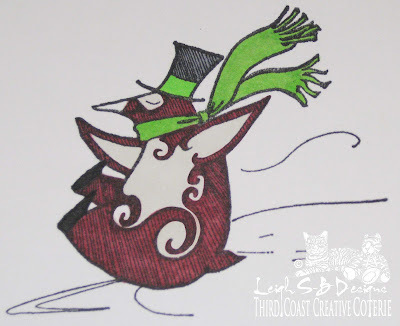 "Percy On Ice" Removable Christmas Tree Ornament Card designed for the 3CCC! 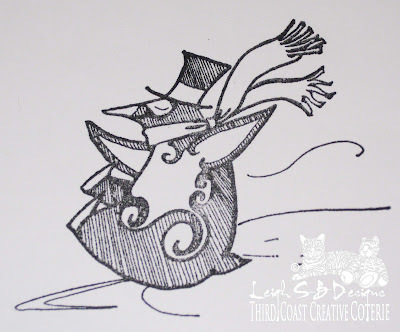 It's pouring down outside so I'm in a winter mood today and thought I'd share this project I designed for the Third Coast Creative Coterie! I love hitting the after Christmas sales and picked up this lime green tin tree ornament at Target at the beginning of the year for like 20c with every intention of using it in my art somehow and thought it would work perfectly with the cute penguin stamp called Percy on Ice (VB-211-M) by Third Coast Rubber Stamps! 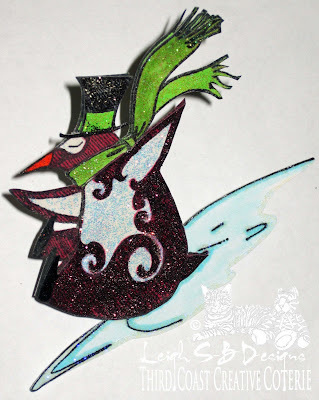 Stamp Percy the Penguin twice with Tuxedo Black Memento ink on Neenah Solar White cardstock. Colour in both images with Copic markers. I used R39 on the body of the penguin, G24 and YG06 on his scarf, YG06 and C5 on his hat, BG000 and BG01 on the ice and YR09 on his beak. I didn't colour the ice on the first image because I wouldn't be using it and I wasn't super careful with my colouring on the 2nd image on the penguin body where I knew it would get covered up so you'll notice some over bleed in the photo below. 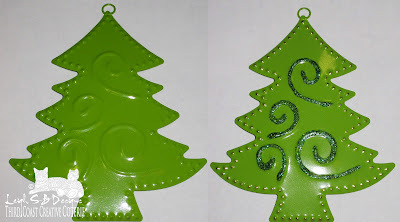 Cut out sections from the first image and apply various colours of glitter glue to both images as shown. While the glitter is drying I jazzed up the metal Christmas tree by highlighting the punched areas with a broad point metallic gold paint pen and glitter glue. Adhere all the cut out sections to the 2nd image with micro pop dots. But I adhered the scarf section around the penguin's neck to the 2nd image with glue coz I only wanted the tails of the scarf to be dimensional. 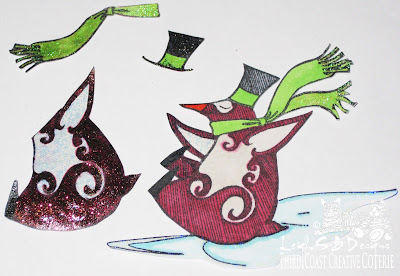 The glitter glue made the cardstock curl a bit which adds to the dimension and really brings the layered image to life! 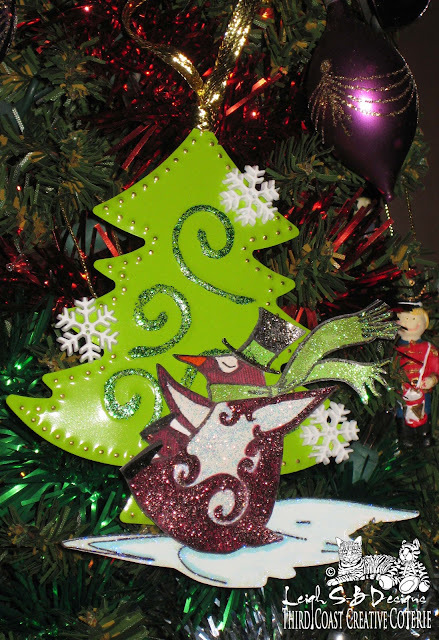 Adhere the penguin to the metal tree with pop dots and embellish with snowflake buttons which I glued on and add the gold hanging cord which came with the ornament. You could give the ornament as a gift as is but sometimes I like to turn my ornaments into Christmas cards too which is what I did for this one! 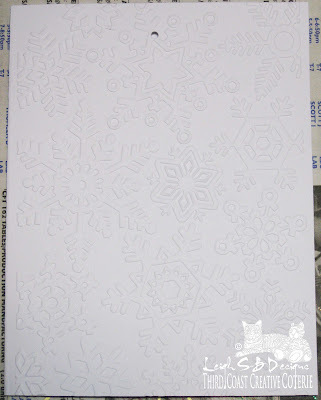 Make a folded card from white cardstock and emboss the front with a snowflake embossing folder by Cuttlebug. Punch a small hole for the hanging ribbon of the ornament to slot through and secure it inside with a bit of sticky tape to make it easy for the ornament to be removed! 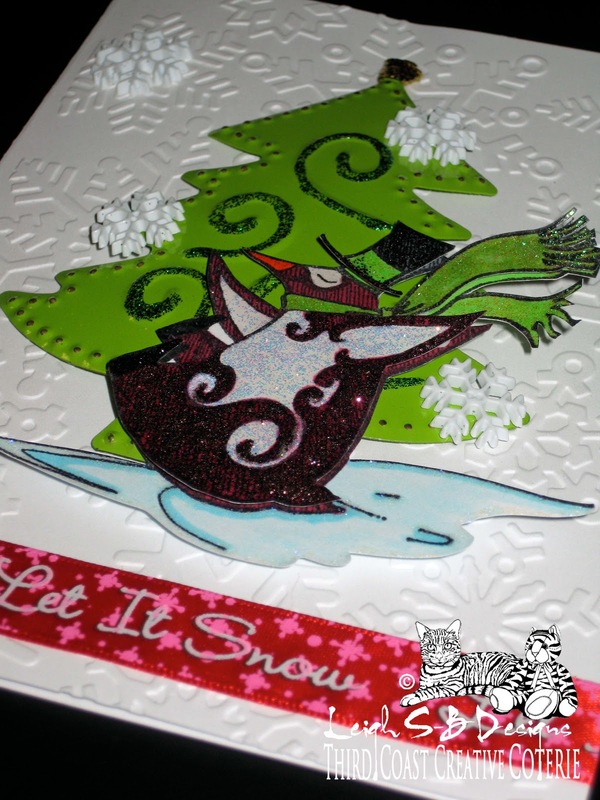 Embellish the card with Let it Snow ribbon and more snowflake buttons and you're done! I love the way my little ornament card turned out and can't wait to see what my nephew thinks of it! Thanks for visiting my blog today and have a wonderful and safe week! Cute penguin! Another great idea, Leigh!! Such a beautiful creation! Thanks for joining us this week at Lollipop Crafts! Love how you gave such detailed instructions. Adorable image!! Thanks for playing along with us at My Sheri Crafts. Love the penguin image. Absolutely BEAUTIFUL! Great Job! Thanks for joining us at Lollipop Crafts, Good Luck! Really cute card and ornament idea! Your nephew will love it! Thanks for joining us at My Sheri Crafts! 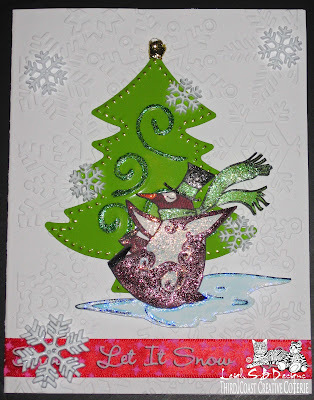 Great card & ornament - so sparkly and festive! Thanks for playing at Wee Memories this week! So cute. Percy just makes me smile. I bet your nephew loved it!